Matsuzaka is official. Red Sox Nation rejoice!! For those of you that have been coming to Matsuzaka Watch for a long time, and for those just checking in, I'd like to share my feelings with you about the addition of Daisuke to the Red Sox roster for the forseeable future. I'm not going to get into my feelings about his performance. You can read about how highly I think of him in my various pieces of writing here. I want to write about some feelings I have as a person. I'm a Yankees fan. For some people in Red Sox Nation, that means there's a license to go around the internet trolling and generally casting dispersions about my mental health, personal character, and intellect. So be it. I live in Japan and I love the respect that people have for one another, that seems to be sadly absent from US culture at the moment. I'm a big boy, and I can take it. On the other hand, there are a lot of intelligent, well-mannered, and decent fans in Red Sox Nation that have exchanged ideas and thoughts on Japanese baseball, Matsuzaka, and the Yanks/Sox rivalry. I enjoy those conversations. Thank you for raising the rivalry out of the gutter for a minute. As a Yankee fan, and an absolute Daisuke fanatic, I've walked a very tough road personally over this turn of events. I think it's great that American fans will get to see the real top flight talent that exists among the Japanese pitching ranks, and maybe put to rest the Irabu comparisons for good. I also think it's a wonderful thing that the bridge between two cultures that understand so very little about one another will be extended to another American city. I hope people in New England will learn something about Japan. What you think you know about this mysterious country is probably not 100% accurate. I'd like to continue to bring you some pieces of writing about Japan via Baseball Japan, my comprehensive blog on the whole of the game over here. I will be working more and more on content over there, and I hope you drop by. As much as I wish it was Brian Cashman putting a Yankee hat on Daisuke, I was extremely proud as an American to observe the first class treatment that the Red Sox organization has given to Matsuzaka. If anyone from the organization happens to read this blog, I want to thank you personally as an American living abroad in Japan. I work very hard to be a good ambassador to my country every day I'm here, and the work you've done to make Matsuzaka feel welcome hasn't been lost on the Japanese people. The smile on Daisuke's face told a million stories, and I think you've probably won a lot of fans through your show of courtesy. I'm in the difficult position of wanting Matsuzaka to win every start he makes, but not at the expense of the Yankees winning the division. That won't win me any fans here, but I promise to keep writing as objectively as I can. I am too big a fan of this player to let any team allegiance spoil it for me. I've spent too many hours and days working on this blog to piss it all away on pettiness. 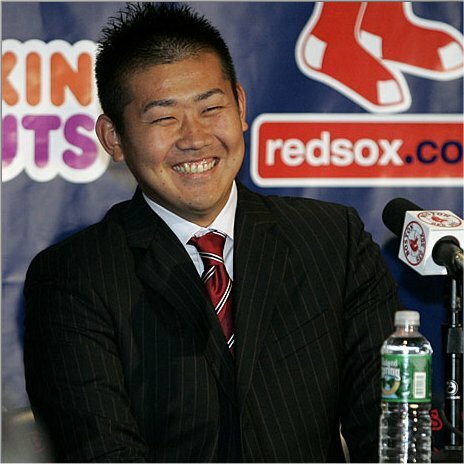 If you will accept me as a mouthpiece for the great chronicle of Daisuke Matsuzaka in America, I promise that I will never treat the Red Sox with disrespect here, and I will always do my best to present as unbiased an account of things as is humanly possible. I believe in that very much. Last word today. Please extend Daisuke the courtesy of a little wiggle room should he struggle to start the season. For all I know, he'll come out guns blazing, but there is a very real cultural adjustment between the East and the West, and the transition between Japan and the US, and vice versa, is a trying and confusing one. We are the same in some fundamental ways, but in most respects we are almost opposites culturally. Thanks for reading. Go Daisuke!! Give 'em hell. I read your blog would love to talk and host you at Fenway. 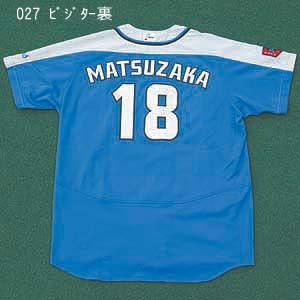 Can't wait for the Daisuke Matsuzaka era to begin in Boston! Thanks for making this blog, it's been interesting to follow along through all of this. On a side note: I really want to get that replica jersey but can't find it anywhere. I am a sox fan living in Virginia. However, I was born in Tokyo and spent virtually my entire childhood in various capital cities in Asia. As such, I understand your comments about the importance of treating people with respect and how much communication between different cultures can be greatly enhanced by the thoughtful gesture and the extra bit of hosptitality. It will be interesting to see Matsusaka adjusts to the scrutiny that comes from Red Sox Nation - which while I am a member - cannot imagine being on the other end of the microscope. But one thing about the Red Sox fans is that they do know baseball. Hopefully they will learn a little from Matsusaka at the same time that he learns about them. Last year Hideki Matsui broke his wrist trying to make an aggressive fielding play. At the press conference after the game, he apologized to the fans for hurting himself. Certainly not necessary - but gracious and very Japanese. I hope to have many more conversations about this as his career develops - but my parting comment is that Matsusaka will find Varitek to be a great catcher to break into the American League with. Once Varitek learns all the pitches that are in his arsenal, it will be fun to watch. Thanks Mike for all the work you put into informing a nation about what we hope to be a truly special player. Your work was for many of us the jumping off point on all things Matsuzaka. I look forward to continuing to read Matsuzaka Watch. If you ever want to pen something for the Red Sox Times, just drop me a line. I would be happy to have your expertise on Daisuke inform our readers. I would like to know your opinion of Kei Igawa too. Most yankee fans are expecting nothing more than a #5 starter out of him. Are they wrong in thinking this or what? Can you give me some stats to prove otherwise? I hope you might consider re-enabling comments. Discussions on high-quality blogs like MLBTradeRumors.com are part of the fun. This blog has long been my #1 source for analysis of Matsuzaka. I'd love to be able to read and participate in discussions here. Maybe you could require registration, or ban aggresively? I'm a Yankees fan. For some people in Red Sox Nation, that means there's a license to go around the internet trolling and generally casting dispersions about my mental health, personal character, and intellect. Well, as a Sox fan, let me just say... it's "casting aspersions," you retard!!!!! Just kidding. Sorry that people irritated you before, I hope that you might reconsider the comments policy. It'll increase your utility and your traffic. As is, there aren't any comments at all anymore, which is really too bad.